‭Here are the answers we give to the questions we are usually asked for concerning this letter. Who are the originators of the‭ ‬letter‭? The originators of this letter are ex-Muslims with some of their friends,‭ ‬exasperated,‭ ‬not only by the widespread‭ ‬Islamic talk within the Church,‭ ‬whose Pope is the outstanding person in charge,‭ ‬but also for not having received any answer,‭ ‬not even an acknowledgement to the letters they have sent him on that subject. How did you meet‭ ‬yourselves‭? ‬Are you all‭ ‬French or from different‭ ‬countries‭? We are not all‭ ‬French and we met ourselves through various ways,‭ ‬even through social networks. Are the originators of this letter part of an‭ ‬association‭?‬ If they are,‭ ‬what is the name of this‭ ‬association‭? ‬Do you have a leader or‭ ‬a‭ ‬chairman‭? ‬Do you have priests or bishops acting as‭ ‬references‭? Many of us are members of registered associations,‭ ‬which support ex-Muslims and/or evangelize‭ ‬Muslims.‭ ‬They are so few that you do not need a long time to find them on the web.‭ ‬We have neither‭ ‬leader nor chairman,‭ ‬except Jesus Christ,‭ ‬for whom we have accepted to lose everything.‭ ‬And there are,‭ ‬in fact,‭ ‬too few priests to support us. Do you know how many ex-Muslims have signed the‭ ‬letter‭? Presently,‭ ‬we do not know yet.‭ ‬As we have explained in the presentation of our letter,‭ ‬ex-Muslims,‭ ‬who know they are condemned to death by‭ ‬Islam,‭ ‬try,‭ ‬generally,‭ ‬not to make themselves known.‭ ‬So,‭ ‬the names of the ex-Muslims signatories and,‭ ‬eventually the names of the associations they belong to,‭ ‬will be revealed only to the Holy Father,‭ ‬in case he asks them. How many signatures do you want to collect before‭ ‬delivering the petition to the‭ ‬Pope‭? Your petition is similar to the‭ “‬Correction filialis‭” (‬http://wwwcorrectiofilialisorg/it/‭) ‬which has been done and signed by priests,‭ ‬theologians and bishops.‭ ‬Instead,‭ ‬you have decided to open it up,‭ ‬limitless,‭ ‬to all the‭ ‬faithful.‭ ‬Why‭? ‬Don’t you think that your petition might appear less valid or less‭ ‬serious‭? We think that it is not necessary to be a recognized theologian to acknowledge the demoniac nature of‭ ‬Islam,‭ ‬and that anybody having some sense may understand,‭ ‬even if he has not the faith,‭ ‬that you can’t serve both Church and‭ ‬Islam,‭ ‬or the Christ and the Antichrist. Don’t you think it might be‭ ‬presumptuous for the‭ ‬faithful‭ ‬to pretend to correct the Pope‭? It is a‭ ‬good question.‭ ‬If‭ “‬for God judges everyone by the same standard‭ (‬Rm‭ ‬2.11‭)” ‬shouldn’t we‭ ‬not‭ ‬imitate him‭? ‬And this,‭ ‬ever,‭ ‬especially since‭ ‬«in case of imminent peril to the faith,‭ ‬inferiors must publicly correct their superiors.‭ ‬That is the reason why‭ ‬Saint Paul,‭ ‬who was inferior to saint‭ ‬Peter,‭ ‬publicly corrected him,‭ ‬because there was a danger of scandal as far as the faith was concerned.‭ ‬And it is said in saint Augustin’s gloss‭ (‬ex Epist.‭ ‬19‭) ‬of this passage:‭ ‬saint Peter taught by his example to those of the front rank,‭ ‬that,‭ ‬if they happened to veer off the right path,‭ ‬they should not be‭ ‬embarrassed to be corrected by those below them‭ (‬Saint Thomas d’Aquinas Theological Sum,‭ ‬11-11‭ ‬Q.‭ ‬33‭ ‬a.4‭)”. Do you think that the Church should abandon the interreligious dialogue with‭ ‬Islam‭? ‬Should the Church fight‭ ‬Islam‭? What dialogue with‭ ‬Islam‭? ‬What relationship,‭ ‬in fact,‭ ‬between justice and‭ ‬impiety‭? ‬What link between light and darkness‭? ‬What understanding between Christ and‭ ‬Satan‭? ‬What association between the faithful and the‭ ‬unfaithful‭? 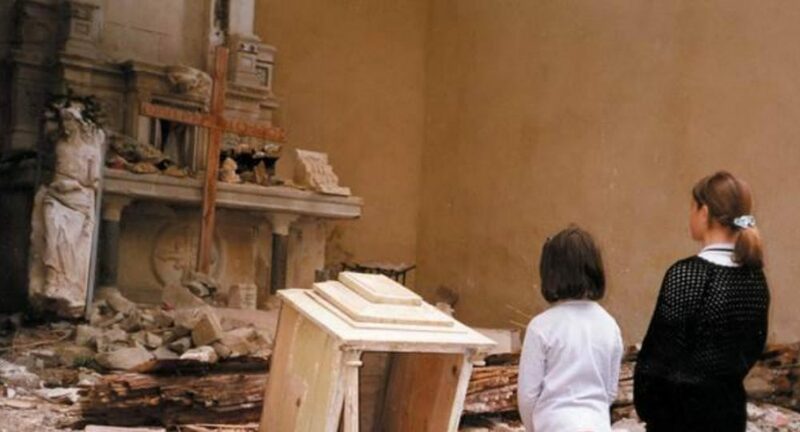 ‬(2‭ ‬Co‭ §‬ 11-15‭)‬.‭ ‬Of course,‭ ‬the Church must fight‭ ‬Islam,‭ ‬to guarantee its survival and the salvation of its children,‭ ‬as well as of those who are still‭ ‬Muslims.‭ ‬Because‭ ‬Islam threatens them directly,‭ ‬for its mission is to destroy them and take their place‭ (‬Coran‭ ‬2.193,‭ ‬9.30‭) ‬who may come after Christ if not‭ ‬Antichrist‭? In your letter,‭ ‬you beg the Pope to make a‭ “‬frank and just speech‭” ‬on‭ ‬Islam.‭ ‬What would you like to hear from the‭ ‬Pope‭? That he tells‭ ‬the truth about Islam,‭ ‬or,‭ ‬failing that,‭ ‬that he keeps‭ ‬silent‭! What‭ ‬would be the consequences of‭ ‬the Pope’s attitude towards‭ ‬Islam‭? Did Jesus indicate any other way than the‭ ‬Cross‭? In your letter,‭ ‬it seems that you accuse the Pope of willing to‭ ‬Islamize Europe.‭ ‬Does the Pope contribute to‭ ‬European‭ ‬islamization‭? ‬If so,‭ ‬why‭ ‬do you assume‭ ‬this‭? For several reasons‭ ‬:‭ ‬1‭) ‬By asserting falsehoods concerning‭ ‬Islam,‭ ‬such as if he had wanted to let‭ ‬Islam appear sympathetic and kind‭ ‬2‭) ‬By encouraging the invasion of the West by‭ ‬illegal‭’‬s of‭ ‬Muslim denomination,‭ ‬in disobedience to an apostolic order‭ (‬2‭ ‬Jn‭ ‬1‭ ‬10-11‭). In your‭ ‬opinion,‭ ‬why is the Pope so‭ ‬accommodating with‭ ‬Islam‭? ‬Why,‭ ‬in your opinion,‭ (‬as you wrote it‭) ‬does he propose the Coran as a way of‭ ‬salvation‭? This is a profound mystery for us. Violence is in the‭ ‬Coran‭? ‬Is‭ ‬Islam a violent‭ ‬religion‭? You just have to read the Coran,‭ ‬Mohammed’s life and to consider‭ ‬Islamic history to be convinced.‭ ‬Jesus announced that a time shall come when those who would kill‭ ‬Christians would believe they worship God‭ (‬Jn‭ ‬16.2‭)‬.‭ ‬In what other religion than‭ ‬Islam is taught to hate‭ (‬Coran‭ ‬60.4‭) ‬to death of‭ ‬Christians‭ (‬Coran‭ ‬9.‭ ‬30‭)? What will you do if the Pope does not change his attitude towards‭ ‬Islam‭? We shall continue suffering and apologizing to God for him,‭ ‬still hoping for a Pope in accordance with His Heart. Are you ready to leave the‭ ‬Catholic Church‭? In your letter,‭ ‬you criticize the Pope for his position on migration.‭ (‬Are you all‭ ‬European ex-Muslims‭? )‬ Why would immigration be dangerous for Europe‭? Those of us who are not native of Europe would not have found abnormal or unfortunate to have to abandon‭ ‬Islam in order to enter Europe. According to you,‭ ‬should‭ ‬Christians or the Church try to convert‭ ‬Muslims‭? May we think that kindness to‭ ‬Islam is not a‭ ‬betrayal‭? ‬Who said:‭ “‬He who does not‭ ‬assemble‭ ‬up‭ ‬with me,‭ ‬disperses‭»‬?